From the Bratislava Airport: After you leave the airport, drive the Ivanska road (Ivánska cesta), join the motorway bypass D61 (direction Wien, Petržalka) and drive on the motorway bypass for about 11 km (shortly you will drive over a bridge Prístavný most, follow the direction Wien, Brno). After passing Petržalka, take the direction Brno, drive over the Lafranconi Bridge, through Mlynská dolina, you are on a motorway bypass, and leave the motorway direction Devínska Nová Ves, direction Volkswagen (VW). Before you reach VW turn left – on Jána Jonáša Street, you will pass the VW factory on your right. Then take the second turning on the right. Drive the Ľubovníková Street, then Mečíková Street 54. From the Vienna Airport at Schwechat: Take motorway E58 direction Bratislava (please, pay attention not to miss the diversion to Bratislava), after passing the border crossing Jarovce – Kittsee drive direction Brno. Leave the motorway direction Devínska Nová Ves, direction Volkswagen (VW). Before you reach VW turn left – on Jána Jonáša Street, you will pass the VW factory on your right. Then take the second turning on the right. Drive the Ľubovníková Street, then Mečíková Street 54. 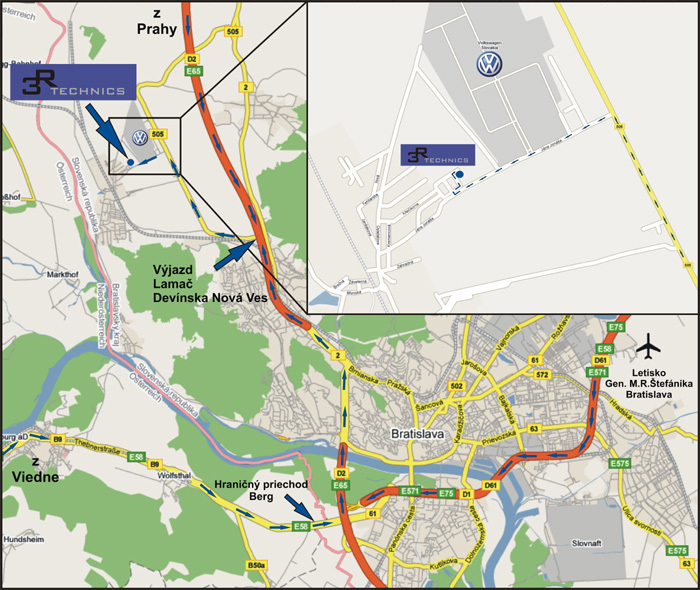 From the direction Brno / Malacky: Before you reach Bratislava leave the motorway direction Devínska Nová Ves, direction Volkswagen (VW). Before you reach VW turn left – on Jána Jonáša Street, you will pass the VW factory on your right. Then take the second turning on the right. Drive the Ľubovníková Street, then Mečíková Street 54. From the direction Dunajská Streda / Šamorín: join the motorway bypass D61 (direction Wien, Petržalka) and drive on the motorway bypass for about 11 km (shortly you will drive over a bridge Prístavný most, follow the direction Wien, Brno). After passing Petržalka, take the direction Brno, drive over the Lafranconi Bridge, through Mlynská dolina, highway approach, and leave the motorway direction Devínska Nová Ves, direction Volkswagen (VW). Before you reach VW turn left – on Jána Jonáša Street, you will pass the VW factory on your right. Then take the second turning on the right. Drive the Ľubovníková Street, then Mečíková Street 54. From the direction Trnava / Senec: Continue on the motorway bypass D61 (direction Wien, Petržalka) and drive on the motorway bypass for about 11 km (shortly you will drive over a bridge Prístavný most, follow the direction Wien, Brno). After passing Petržalka, take the direction Brno, drive over the Lafranconi Bridge, through Mlynská dolina, highway approach, and leave the motorway direction Devínska Nová Ves, direction Volkswagen (VW). Before you reach VW turn left – on Jána Jonáša Street, you will pass the VW factory on your right. Then take the second turning on the right. Drive the Ľubovníková Street, then Mečíková Street 54.